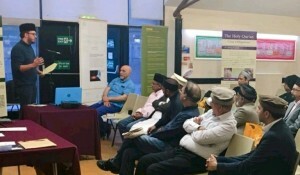 The event, aimed to shed light on the concept of Ramadan fasting and to promote “a deeper understanding of the peaceful teachings of Islam”, was attended people from several different faiths and ethnic backgrounds. The regional missionary in charge of the community, Mr. Humayon Uppal, described the origins of the Ahmadiyya Muslim Community, which was founded in 1889 by Mirza Ghulam Ahmad and how Islam’s peaceful teachings promoted cohesion among different sections of a society. “True Islam” he said, gives complete freedom of religion, upholds women equality and signifies on loyalty to one’s country. 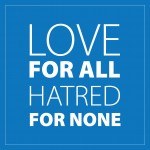 The Ahmadiyya community is now established in more than 210 countries and is led by a system of Khilafat (Caliphate. His Holiness Hazrat Mirza Masroor Ahmad is the fifth Khalifa of the community and is based in London from where he leads his global community. After a silent prayer, the guests were served with refreshments including dates, fruit kebabs, samosas and drinks to break the fast. Mr.Humayon then led the members of the community in congregational prayer after which a delicious dinner was served which included; chicken korma, vegetable rice, spinach paneer, curry and naans followed by tea and deserts and guests were given goody bags to take away.